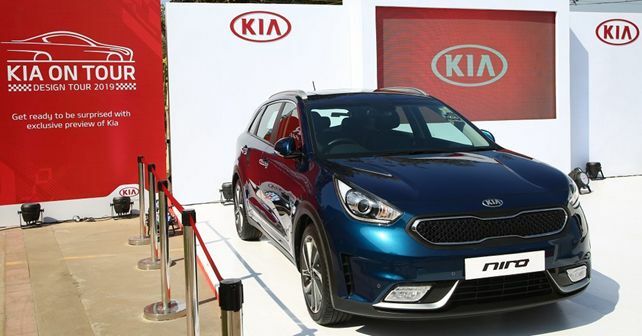 In a bid to familiarise potential customers with the brand, the Kia Design Tour 2019 went through 26 cities across India to display the Niro, Carnival and Sportage vehicles. Kia Motors India (KMI) successfully concluded the second phase of its 2019 Design Tour, which followed a 'roadshow' format and showcased the Kia Sportage and Niro SUVs, along with the Carnival MPV (which we recently reviewed and tested). With such roadshows, KMI aims to gauge the public response to its larger vehicles, which are more suited to the Indian conditions. However, there's no confirmation at the moment of these particular models making their way to India but, it certainly gives us an idea about the kind of products KMI would like to launch here. The multi-city tour commenced from Jamshedpur on 16th January and culminated in Bhopal on 15th March 2019, visiting 26 cities and covering close to 15,000km in total. The Korean brand received good feedback from the Design Tour, reaching out to nearly 10,000 potential customers. Gearing up for its first product launch here in the second half of 2019, KMI has already started trial production of the SP2i SUV at its Anantapur facility in Andhra Pradesh. Moreover, KMI has also announced its first dealership tie-up with Allied Motors in Noida, Uttar Pradesh and has also partnered with multiple financial service-providers to offer exclusive finance deals and packages to its potential customers. Post the launch of the first product, KMI intends to launch a new product every six months in India.